You might be familiar Thom Hartman’s notion of the lives of hunters and the farmers as a explanation of ADHD traits. You can read more about it in his book Attention Deficit Disorder . But in a nut shell: Hunters have to pay attention to everything that’s going on around them–see the rabbit in front AND the bear in the back. Farmers, on the other hand, have to wait a lot. They have to focus and pull weeds and not the food. Wait for the weather. In this picture the farmers are better suited to sit in school and focus and learn. The hunters are too busy paying attention to the kid in the back row who’s making spit balls. Obviously much more interesting than world history. Sometimes attention to exactly what you’re supposed to be doing is the right thing. And sometimes seeing the big picture and all the stuff going on around you is the right thing. I’m thinking small business owners have to be a lot like hunters. You gotta pay attention to everything all the time and make decisions based on as much information as you have. You can’t always wait for more. Anyway, Thom’s theory is a great way to explain ADHD to kids at the very least. AND it’s really nice to get some scientific study to support it. This entry was posted in ADHD on 6/19/2008 by Kerch McConlogue. Schedule II meds to be prescribed in 90 day lots! Today, DEA is unveiling a proposed rule that will make it easier for patients with chronic pain or other chronic conditions, to avoid multiple trips to a physician. It will allow a physician to prescribe up to a 90-day supply of Schedule II controlled substances during a single office visit, where medically appropriate. What great news for people with ADHD who just plain forget to go to the doctor’s every month, who forget to go to the pharmacy when they know they’re running low. What great news for mothers who wind up paying, on O SO many levels, for kids that run out. Thank you, DEA. Seems like you’re doing the right thing. This entry was posted in ADHD, General on 9/9/2006 by Kerch McConlogue. Sometimes, they say, it’s a good idea to let people know what you’re thinking while there’s still time to adjust the plan. We often get a visiting family member of one of the adults – a wife, husband, mother, sister, aunt — someone who thinks the adult with ADHD needs some help. We all understand it’s important to educate the “others” in our lives. The group is always supportive of new people and their “other,” but I don’t like those people to come more than once. The person who does not have ADHD sometimes takes over the meeting with their questions. And that’s not what we’re about. But last night, someone suggested we might plan one meeting particularly for adults with ADHD and their “other” who ever that may be. This would be one time when we’d be happy to see all those “others” out there and answer what ever questions they have and offer what ever help we might give. We’ll likely have the meeting on the west side of the Baltimore metropolitan area. But lots of stuff could change. What I’m curious about is this: What would you like to learn from a meeting like that? Do you think it’s a good idea? Would you come and bring someone? Drop me a note and let me know what you’re thinking. I look forward to hearing from you. I like the help of others! This entry was posted in ADHD, General on 8/17/2006 by Kerch McConlogue. by Thomas E Brown, Ph.D.
For years Thomas E. Brown, Ph.D. has been paying attention to the stories of patients with AD/HD. As associate director of the Yale Clinic for Attention and Related Disorders and assistant clinical professor of psychiatry at Yale University School of Medicine, he also knows the science behind the diagnosis. 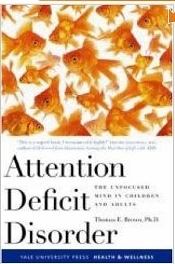 The result is a new book, Attention Deficit Disorder: The Unfocused Mind in Children and Adults. Like Dr. Brown’s very popular talks at annual ADDA conferences, it presents the stories he’s collected during his clinical experience and pairs them with recent research to draw a clear picture of ADHD. These executive function impairments are often described as being like a slightly off maestro lacking control of an orchestra. He has trouble managing the starting and stopping of thoughts and actions; his memory and focus are disorganized and undependable. Executive functions impaired in the ADD syndrome are not simply skills to be learned. ADD Syndrome is not about a lack of will power. Trying harder will not fix it. And medication is not magic — Pills can’t teach skills. As for any disorder, the most important thing in successful treatment of ADD is education about what it is, what it does, and how it affects the person and his family. The education in this book is clear and comprehensive in its offering. Brown’s references to the problem of emotional modulation for people with ADD is not reflected in the DSM-IV* but it makes sense in my limited experience. I also found some interesting explanations for other problems that I didn’t know were related to ADHD. For example, I learned that while I may understand all the words my children use to describe their day, my ability to repeat them – word for word — it is out of scale with my understanding of the story. An obscure fact? Perhaps. But I believe knowing that’s common for people with ADD will help me appreciate why a verbal grocery list is less effective than a written one. ADD is, if anything, a collection of symptoms – widely varied in those diagnosed with it. For clinicians, this book has the studies to back the premise that ADD Syndrome includes a more complex collection of markers. For parents or adults with ADD, this book lays out the intricacies of the bits and pieces of behaviors that have just not made sense before. This entry was posted in ADHD, Book Review on 11/11/2005 by Kerch McConlogue. Roland Rotz, Ph.D. and Sarah D. Wright, M.S., A.C.T. Do your kids swear that listening to music while they do homework actually helps them concentrate? Can you sit still OR focus, but not both – simultaneously? If your answer is “yes,” you might already understand the art of effective fidgeting – using simultaneous sensory-motor activities to increase your ability to pay attention. The beauty of fidgeting in order to focus is that it works for everyone, not just people with ADD. Moving your body is particularly effective. Running, walking or even plain old recess activities help many people attend even after those activities have stopped. Personally, I find knitting to be a great way to keep myself focused while attending mlong meetings. It actuates the sense of touch, and it’s much better than picking at my nails. Color coded file folders are more plesant to look at so they help make the drudgery of filing a bit more interesting. Key is to identify socially acceptable forms of fidgeting. Whether it’s doodling in a notebook while listening to a lecture, chewing gum while taking a test, or racing against the clock to finish a tedious task like cleaning the kitchen, what makes it work is using different senses for the fidget and for the focus. This short book is structured with review points at the end of each chapter. It aims to help you identify your own socially acceptable devices to keep one part of your brain busy while allowing greater focus by another part. The strategies suggested in the text and in the “Fidget Strategies Workbook” included with the appendices will likely lead you to think of other techniques that will work for you. You’ll find suggestions for using your senses: sight, sound, touch, taste and smell as well as movement, time awareness, or a companion. “Effective fidgeting uses a second sensory-motor activity, one other than that needed for our primary activity, to help us stay alert and focus the primary activity.” These secondary activities might include listening to loud music while doing housework, racing against the clock to finish a tedious task like cleaning the kitchen, doodling in a notebook while listening to a lecture, or chewing gum while taking a test. “Some of the strategies we use to simulate ourselves into interest and thus action, e.g. procrastination or emotional conflict, can have undesirable side effects.” The authors warn that if you don’t actually choose your method of fidgeting, you could wind up doing something harmful: perhaps something as simple as picking your cuticles or more problematic smoking or engaging in some other addictive behavior. This entry was posted in ADHD, Book Review on 10/6/2005 by Kerch McConlogue.